Pandy Protein Crispies are unique crisps with high protein content. They have a spicy, distinctive taste; they perfectly replace salty snacks such as chips, crackers, breadsticks. They are much healthier and less caloric, but equally tasty and crunchy. Snacks are primarily meant to taste great. They can certainly satisfy a small hunger, but above all, they are a source of pleasure, we reach for them while working or resting in front of the TV, as they make moments spent in the company of loved ones more pleasant. Pandy Protein Crispies is ideal as a quick bite. It is recommended instead of salty breadsticks, crackers or crisps. It tastes just as good – it is crispy and crunchy. It has a spicy and distinctive taste owed to aromatic spices. It is a real treat for lovers of dry snacks. Proteins are the most important macronutrient, which is especially watched out for by athletes and conscious consumers. The soy protein isolate, which is one of the most popular and most valuable vegetable sources of protein, comes to the fore in the composition of the presented crisps. It contains all the essential amino acids, it is rich in BCAA branched amino acids and provides much more arginine than other types of proteins. Average chips are among the most caloric products. These crisps are healthier and much less caloric equivalent of this type of snack. The producer resigned from excess fat, while the content of sugar was reduced to a minimum. Salty snacks are rarely ever associated with health. Nutritional awareness among consumers is growing and more and more people realize that their health or figure is at stake if they do not give up this forbidden pleasure. You can reach for Pandy Protein Crispies without any worries. They are free from harmful trans fats, contain no fillers, colorings, artificial additives or flavor enhancers. Their composition has been maximally simplified – it is a short, transparent list of natural ingredients. A relatively low caloric value also means a lower risk of weight gain. 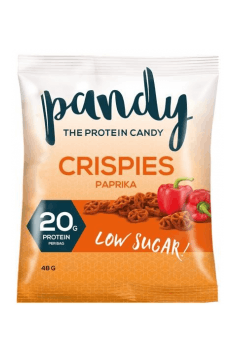 In conclusion, Pandy Protein Crispies are tasty, spicy crisps that perfectly replace popular, savory snacks. In addition, they allow for increasing the proportion of dietary protein in an easy and delicious way. Due to the low fat and sugar content, they pose no threat to the body or health. Use according to the individual daily calorie requirement. The product can be recommended especially to those who enjoy salty snacks such as chips, breadsticks, or crackers. It has a much better composition and much fewer calories. It will work as an independent high-protein snack, and, when crumbled, it will increase the attractiveness of a salad. Soy protein isolate (42%), corn semolina (26%), sunflower oil, chicory inulin, corn flour, salt, paprika powder (2%), spices, whey protein (milk), sugar, anti-caklng agent: silicon dioxide, antioxidant: extract of rosemary.